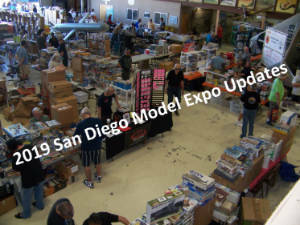 The 2019 San Diego Model Expo will take place on Saturday, June 1 at the San Diego Air and Space Museum annex at Gillespie Field. There will be a vendor area, a model contest, a raffle and more! Check back here often for information about model categories, special awards, etc. The model contest will be hosted by the San Diego Model Car Club and IPMS San Diego. The vendor area will be hosted by the San Diego Air and Space Museum. PLEASE NOTE – because the contest and the vendor areas are hosted by separate groups, there is a small entrance fee for the vendor area and a separate entrance fee for those who wish to enter their models in the contest.